Had a crisis? Maybe Strands of Hope LLC can help. What it offers isn’t much at first glance. A necklace. Yet it’s made by someone who may understand. Family. Friend. Even by a stranger. But someone offering emotional support. That kind of a gesture can mean a lot. And who doesn’t have crises? Strands of Hope is a business established by four breast-cancer survivors who all love to create necklaces and other accessories out of beads. The idea emerged from their monthly meetings for coffee and support: Why not start a business that helps others meet for beading in a way that provides hope and comfort for anybody in crisis? That was five years ago. Participants in Strands of Hope events now have created and given away an estimated 2,400 necklaces. Event settings include churches, Girl Scout meetings, mission trips to Cuba and Guatemala, and a support group for victims of domestic abuse. Strands of Hope is a business established by four breast-cancer survivors who all love to create necklaces and other accessories out of beads. Marty, who has survived more than 12 years since her cancer diagnosis, is the wife of state Sen. John Marty and the daughter-in-law of the prominent religion scholar Martin Marty. The other founders are Joy Throm, Pat Nyman, and Renee Macomber. Marty, of Roseville, is a member at Mount Olive Lutheran Church (ELCA) in Minneapolis; Throm, a member at First Universalist Church in Minneapolis, lives in Minneapolis; Macomber, a member at Plymouth Congregational Church in Minneapolis, lives in Hopkins; and Nyman, a member at Incarnation Lutheran Church (ELCA) in Shoreview, where she lives. Necklaces feature two hearts intertwined in a gesture of supporting each other, as well as glass beads, stones, or pearls. A “random bead” in each necklace bespeaks the unpredictability of lives. Where to place the random bead on the string is the choice of the creator. 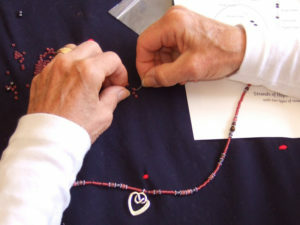 When churches and other groups host necklace-making events, participants are asked to buy a kit for $18. A share of the proceeds goes to charity, says Marty. Strands of Hope is a business, but she says cofounders work as volunteers and the business has not turned a profit. Strands of Hope seeks to "create necklaces, cnnect hearts, and build hope" for those experiencing illness. 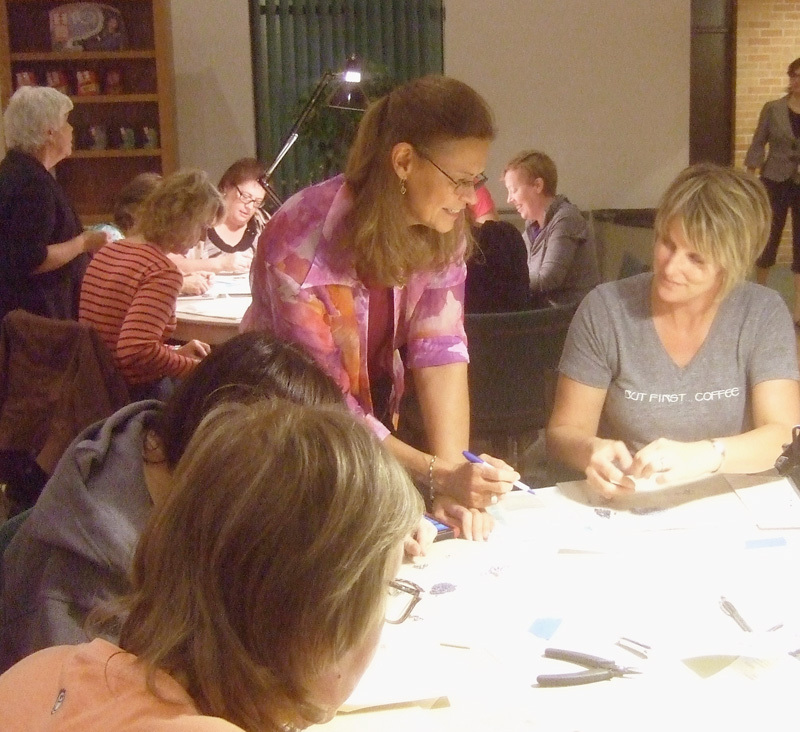 A necklace-making event is scheduled at Christ Church Lutheran at 3244 34th Avenue South in Minneapolis on Monday, November 11 from 6:30-8:30 p.m. It is open to all, no previous beading experience necessary. 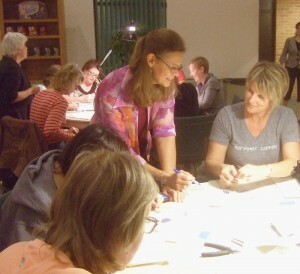 Instructor and tools are provided, as well as snacks. Pastor Leesa Soderlind of St. Michael’s Lutheran Church (ELCA) in Roseville isn’t a breast-cancer survivor herself but knows some. Moreover, she knows many people who have experienced “unpredictable crises in their lives.” So Soderlind joined the beaders at her church October 1. For more information, visit the Strands of Hope website at www.strandsofhope.com. For details about the November 11 necklace-making event at Christ Church Lutheran, contact Mary Bode at 612/721-6611. No previous jewelry-making experience is needed to attend.